Yesterday was International Cat Day. I tried to take some photos when I got home figuring I haven't take their pictures in at least a week, but they were in no mood to pose. I was able to corral them for a hug, a tight, scrunchy, "I love you this much" hug, followed by a kiss on the nose, followed by a leap off the lap indicating they couldn't wait to get away from me. 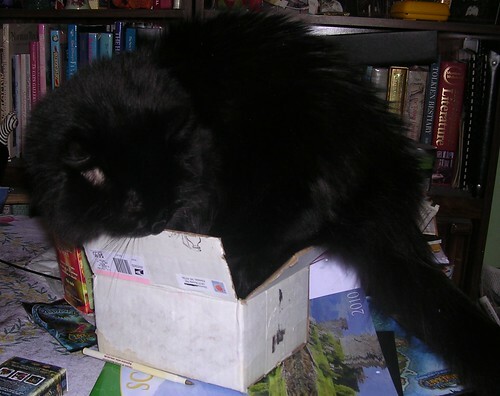 I've gone through the cat folder in my Flickr account and I have selected two of my favorite photos of them to reshare. I love this one of Mija. This is trust. This is love. 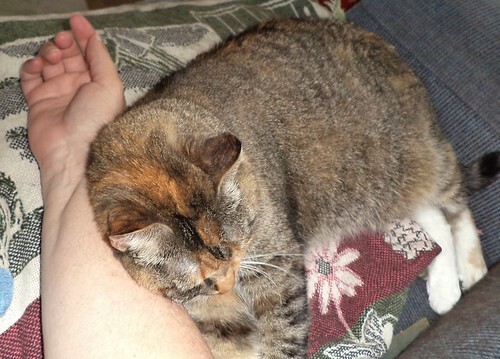 Yes, this totally interrupts whatever it is I want to do since she's lying on my right arm and I'm right handed, but I don't care. This exemplifies our relationship. I love this one of Pilchard. 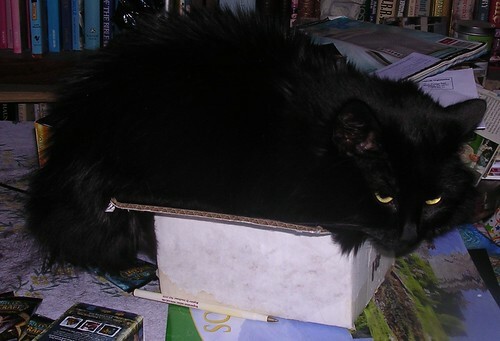 She never met a box she didn't try to get into. Of course this was too small, way too small for a 12 pound cat. Did that stop her? She's my diva. She rules the roost. She causes the problems but she's also my lap cat and my alarm clock if only because the food dishes are empty. Sometimes, especially when I have the potential to be suddenly deployed to a job that may require an overnight stay, I think how much less complicated life would be if I didn't have to call Pam and ask, "Can you feed the girls because I have to go to Iowa for work?" Yes, my livingroom rivals a packing store and I never have completely white clothing. It always has black hair on it. And yet, when I come home and there are faces waiting for me, faces that sleep with me and sit in my lap, I cannot imagine life without cats. Today is National Book Lover's Day. I am a happy lover of books. I'm not reading a book at the moment. I finished 2 magazines last night from the stack and seeing how few are left on the stack makes me inspired to work on magazines over my upcoming vacation. Either a book or magazine is good for sitting on the deck in the morning with a mug of tea and a bowl of fresh cut fruit. I might pull a book out of this stash and start it. We'll see. So, two things that define me have back-to-back days. 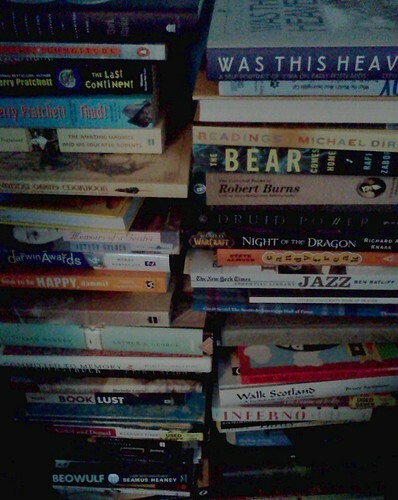 I'll never remember this so I do something interesting next year, although the Book Lover's Day will fall on a weekend. A visit to a bookstore, perchance? Just what I need, more books. I really need to make a list of all my Discworld books so I don't run the risk of accidentally buying one I have. And I don't remember what the next one is in the Thursday Next series I'm reading. I should buy Erik Larson's most recent book, In the Garden of Beasts. It's out in paperback now, although I haven't read Thunderstruck which is in the stacks above. 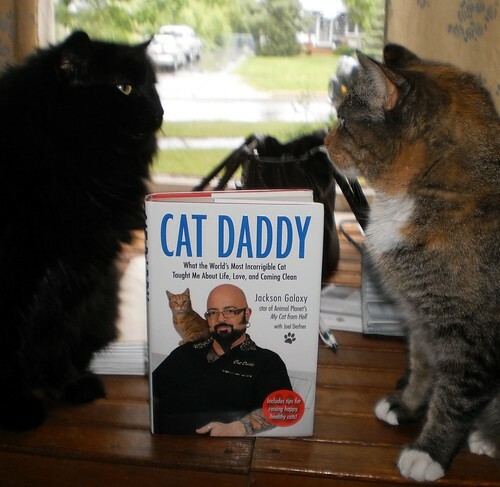 If I combine both loves, I really should read Cat Daddy, the book I won from the blog, Cat Wisdom 101. I was so excited to receive this and, well, it's still in the stack, unread. But, I agree, 100%, with the late Edward Gorey who designed this tee shirt. 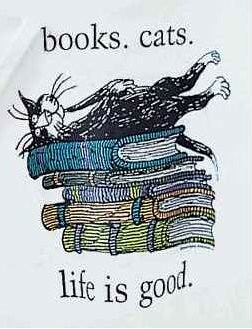 As long as I have a book and a cat, life will always, always be good. Happy National Book Lover's Day to my book loving readers and a belated happy World Cat Day to those who live with cats. If you live with both, double salute.